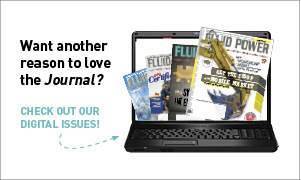 By Rao Choday, VP Sales & Engineering, Servi Fluid Power, Inc.
A very common question asked by people in the fluid power industry is: How often should pre-charge maintenance be done for hydraulic accumulators. Typically, nitrogen gas is used as the medium for pre-charge due to the fact that its properties are close to those of an inert gas but it is not a true inert gas. 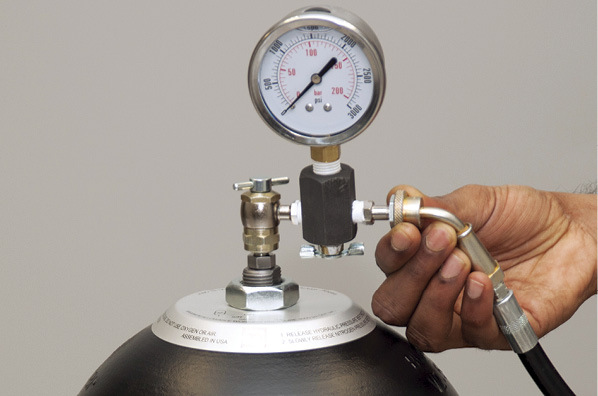 There is an inherent problem with loss of pre-charge gas pressure, primarily due to permeation of nitrogen gas through a rubber bladder or a diaphragm membrane into the system fluid. This loss of pressure must be replenished to ensure optimum performance of the accumulator and avoid any premature failure of the accumulator. The maintenance interval of pre-charge pressure depends on several factors that should be considered. 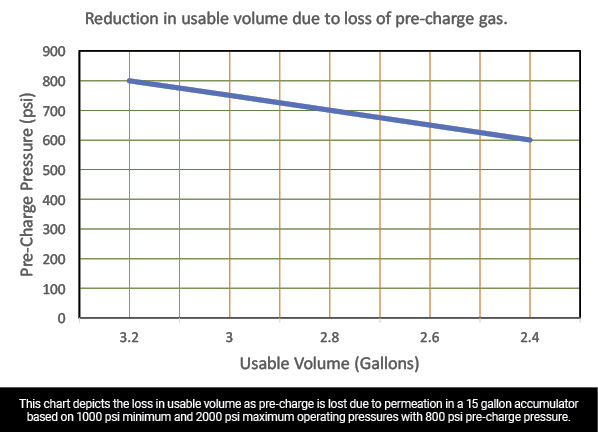 Loss of pre-charge gas happens with all three common types of accumulators — piston, bladder, and diaphragm. The loss due to permeation of gas is negligible in a piston type, but it is an inherent problem with bladder and diaphragm types. Although piston types are impervious, the loss of pre-charge can happen due to normal seal wear, especially with contaminated hydraulic fluid that may result in a damaged cylinder honed surface. Bladder and diaphragm accumulators experience a greater loss of pre-charge pressure due to permeation through the bladder or membrane wall. The permeation rate depends on many factors that will determine the service interval for pre-charge maintenance. Although bladder and diaphragm types are considered high maintenance accumulators compared to the piston type, they are still a preferred choice for applications that require quick response time and rapid cycling. These applications include, but are not limited to, blowout preventers (BOP), closing units in the oil & gas market, stabilizers and steering control in the marine market, suspension and break system in the mobile market, and volume and pressure compensation in injection molding machines. Accumulator sizing programs used to size accumulators typically take the change in gas pressure into account due to variation of temperature and compensate for that, they don’t take the loss of gas pressure due to permeation into account. Therefore, it is important to maintain the correct pre-charge pressure for optimum performance to avoid any downtime. The most common type of bladder or diaphragm used in the industry today is the nitrile compound, which is a superior compound with some of the best properties in terms of compatibility with various fluids, operating temperatures, physical properties, and reasonably good permeation resistance compared to most of the other compounds. 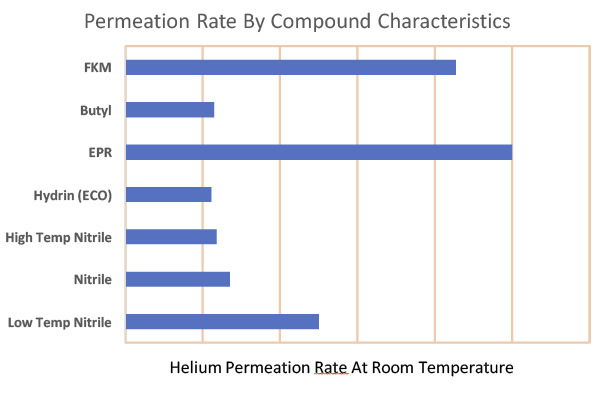 The chart on the next page illustrates the rate of permeation measured with helium at 230°C. Fluorocarbon (FKM) is a superior compound in terms of compatibility with some of the aggressive fluids, but its permeation rate is very poor, requiring shorter maintenance intervals. A low temperature nitrile bladder is widely used in the industry today, especially in low ambient temperature conditions, but the rate of permeation is much higher (see chart below). The rate of permeation of gas through a rubber compound increases with increasing temperature and vice versa. The temperature affects the diffusion of gas drastically. At lower temperature, a gas molecule travels on average at a lower speed and has lower kinetic energy. An increase in temperature increases the average speed and kinetic energy in which the gas molecules move. For this reason, applications where accumulators are working at a high operating temperature require shorter maintenance intervals to replenish pre-charge. Permeation rate is also affected by how much fluid is stored and restored from the accumulator. The higher this volume, the greater the permeation rate. When the compression ratio between the maximum hydraulic pressure and the pre-charge pressure is high, the accumulator stores and restores more fluid during each cycle. The higher the compression ratio, the greater is the surface area of the bladder exposed to the stored fluid, thereby increasing the rate of permeation through the bladder wall. Therefore, applications where accumulators are working with a larger pressure differential between the maximum hydraulic pressure and the minimum hydraulic pressure should expect a greater loss of pre-charge, requiring shorter maintenance intervals. High-cycling applications tend to experience a greater permeation rate than do low-cycling applications. The bladder surface is exposed to the fluid during each cycle, causing the nitrogen to permeate. For this reason, accumulators in high-cycling applications, such as plastic injection molding machinery, require frequent maintenance of nitrogen pre-charge compared to an emergency stand-by application, such as blowout preventers (BOP). It is recommended to check pre-charge pressure after 1 week of commissioning and then after 3 months into operation. Thereafter, depending on the measured loss of pressure and performance, this can be scheduled from 3-6 months or even longer. The general recommendations for nitrogen pre-charge vary by application and are as follows. A properly maintained accumulator with pre-charge pressure ensures optimum performance with less downtime. great article Rao – I thoroughly enjoyed reading it!